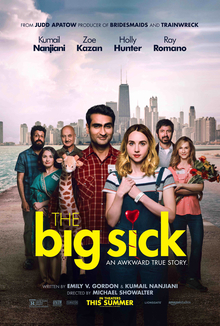 The Big Sick is a charming romantic comedy drama telling, more or less, the true story of Kumail Nanjiani and Emily Gardner who met cute at a comedy club where he was working. It’s a wonderful boy meets girl, girl gets sick, boy stays by her side story that will warm the cockles of your heart and other things. The relationship between Kumail and Emily is what I want. Really somewhere combination of that and Nick and Nora Charles would be the ideal relationship I’m looking for. Your knowing that is irrelevant to your enjoying the film, but it goes some way in explaining why the film moved me so much- it a kind of cinematic wish fulfilment and statement that this really could happen. My romantic leanings aside The Big Sick is a charming film. It’s a film that does considerably more than just be a romantic comedy. Mixed into the film is a hard edged look at the notions of family and what they expect or demand from us even if that isn’t what we want. Kumail is being pressured to marry a nice Pakistani girl. The trouble is that isn’t what he wants. He wants Emily…and he wants his family to accept her. We get to watch as he thrashes about and tries to find the way that makes the most sense for him. We come to understand his battle and we bleed for the choices he has to make. It’s a quietly staggering achievement that lifts this film up to being one of the best of the year. I love this film and highly recommend it.